"Propose to an Englishman any principle, or any instrument, however admirable, and you will observe that the whole effort of the English mind is directed to find a difficulty, a defect, or an impossibility in it. If you speak to him of a machine for peeling a potato, he will pronounce it impossible: if you peel a potato with it before his eyes, he will declare it useless, because it will not slice a pineapple. Impart the same principle or show the same machine to an American or to one of our Colonists, and you will observe that the whole effort of his mind is to find some new application of the principle, some new use for the instrument." 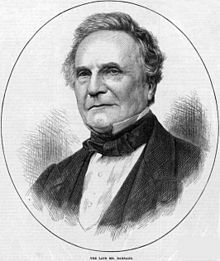 Charles Babbage is most famous for his difference engine, which could arguably be considered the first computer ... but he was a very smart individual in other fields as well, including astronomy, cryptography, and is even credited with inventing the cow catcher. This post is just a wish that more Americans would act like the Americans depicted by Babbage nearly two hundred years ago, and less like the Englishmen. Ask yourself daily which camp you're acting in.